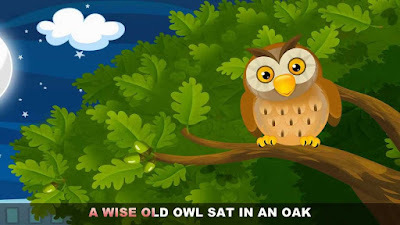 There was an old owl that lived in an oak. He used to hear many things which were happening around his nest. He was watching the incidents those are happening in that village. on his head and the little boy was too little to make the effort to help him. But, still, the little boy used all of his strength and helped the old boy to move his load. Today he saw a girl shouting at her mother. The mother was quite but explained in detail at the end. The little girl regretted not listening to her mother. He was listening to every day a lot of things but did speak less. He was speaking less, but hearing more. He heard people talking and telling stories. He heard a woman saying that an elephant jumped over a fence. He also heard a man saying that he had never made a mistake. He also heard that the little girl was more intelligent than what her mother. The old owl had been observing what people around him were doing every day and he had seen and heard a lot of things going on there. Some wanted to be very proud of what they actually had and soon had the feeling of greatness which was unrealistic what he had. Some became better and some became worse. But the old owl had become wiser each and every day observing the people story and their days how they were going on. You will learn more when you are more observant rather than talking. You can talk but listen more. Talk less, but think and listen, but more. This will make you a wise person and you will be filled with numerous information which is useful in your life.